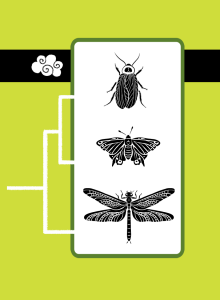 The arthropods of the air are flying insects, a cockroach, Aphthoroblattina; a butterfly, Prodryas; and a dragonfly relative, Meganeura. Over 300 million years ago, insects appeared that could lay their eggs on land they could fold their wings behind them, allowing them to crawl easily. These lines evolved into cockroaches, such as Aphthoroblattina, and later into termites, grasshoppers, walking sticks, and their relatives. The butterfly Prodryas represents the clade of insects that develop first as larvas, then as pupas, and finally as adults. These insects, including ants, bees, and flies, have been even more successful than the roaches and their relatives. Among these insects, butterflies are relatively recent. You can think of butterflies as daytime moths, and they evolved from nighttime moths about 50 million years ago. Scientists know about Prodryas from a single, 35 million year old fossil, but it is one of the best butterfly fossils ever found. Meganeura was a predator living 300 million years ago. With a wingspan of 60 centimeters (2 feet), it was one of the biggest flying insects ever. Their clade died out, but the closely related dragonflies have survived for over 300 million years.